We had rainy weekend here. We went nowhere and just watched the last two matches of football world cup at home. My husband and I were happy since our favorite national team became the first winner. 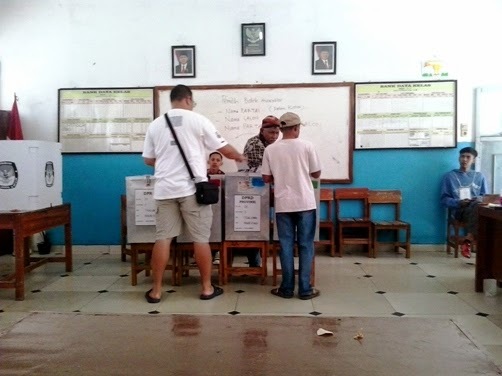 Last Wednesday, July 9th, the presidential election was held here to choose the next president and vice president of Indonesia. I thought before I would know who will be the new president in the afternoon. It turned out that the quick count results of several institutions don’t convey the same statement. Some stated the number one candidate won the election while other results showed the second candidate who elected to be the new president. So, we must wait for the final result of real count at July 22nd. Hope everything’s going well. Captured when legislative election held. I didn't take shots during presidential election last Wednesday. Vote letters of presidential election put into only one vote box. For Blue Monday this week, I share random blue shots. During both general election (legislative and presidential), we voted at a classroom of nearby primary school and luckily, the class is blue. 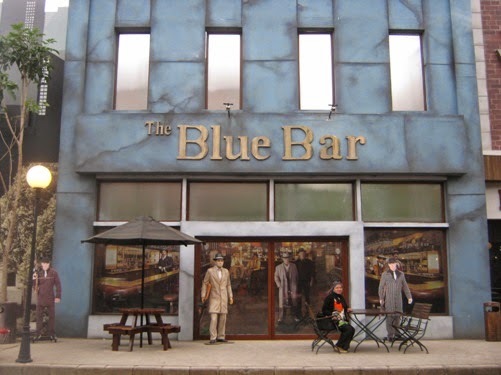 The other is the blue bar which located in Gangster Town studio of the Transportation Museum (Museum Angkut). I love your blue bar shot! I've never heard of this place. And the classroom color would be pretty to see each day at school or voting. semuanya serba biru..ets,,tidak semua, hanya tembok bawah saja..yg diatas warna putih...adem rasanya..semoga tgl 22 Juli demikian juga...adem damai tentram.. Enjoyed learning the election customs in your counrty. Very interesting. So glad you took the time to drop by my place. I like the Blue Bar and the men guarding it but the election photos are great too. Always nice to see how thing work elsewhere. Enjoy the weekend and thanks for sharing.